Optical microscope image (in reflected light) of chondrules (whitish, circular features) from a primitive meteorite. Image courtesy Myriam Telus. 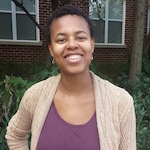 Myriam Telus joins DTM as a postdoctoral fellow from the University of Hawai'i at Mānoa, where for her dissertation she analyzed the in situ Fe and Ni isotopic composition of chondrules from primitive chondrites in order to constrain the initial abundance of 60Fe (t1/2 = 2.6 Myr) and develop the 60Fe-60Ni system for chronology. Telus received her Ph.D. in geology and geophysics from the University of Hawai'i at Mānoa in 2015. Her research in cosmochemistry involves constraining early solar system history through isotopic analyses of meteorites and their components. At DTM, Telus will collaborate with Conel Alexander, Larry Nittler, and Jianhua Wang to measure the in situ C and O isotopic composition, along with 53Mn-53Cr (t1/2=3.7 Myr) systematics, of carbonates from CM carbonaceous chondrites to constrain the compositional evolution of fluids and the timing of aqueous alteration on chondrite parent bodies. She will also carry out in situ D/H analyses of phosphates from metamorphosed ordinary chondrites to investigate the role of fluids and volatiles during thermal metamorphism of chondrite parent bodies. Please join us in welcoming Telus as our newest postdoctoral fellow.